I’ll have to admit I got very irritated at a recent article on Scientific American’s (SciAm) new Food Matters blog about going on a “marketing diet” to lose weight, claiming that marketing is the root of the problem. As a consumer, mother of a teen, and follower of fast food critic Michael Pollan, I agree whole heartedly with the concept that in the US we are being barraged with advertisements for portions that are too large and that there is a big problem. However, putting the field of marketing to blame, rather than societal values, capitalism, or myriad other factors, is unfair. I take issue with the fact that a leading blog is sending a message to scientists that all marketing is evil, because this discipline has the potential to guide researchers to help themselves and the industry in many important ways. This is an important change because companies should have more lofty aims, and because it makes the distinction that marketing is not only used by companies, but by other organizations such as nonprofit entities, and even individuals. I do appreciate that the article points out that consumers are now more powerful than ever at weeding out advertisements from companies, and this change signals that more organizations need to serve their customers rather than just selling to them. I am a big fan of Mad Men and enjoy laughing at the “cigarettes are healthy” campaigns that were run in the 60’s. Can you imagine a company trying to use these tactics now? Sadly, however, new media has brought a resurgence of bad science that is pervasive in dubious publications touting, for example, new age cures for disease or claiming that vaccines are harmful. If we all understand marketing better, perhaps we can fight this disturbing trend. In most successful life science companies, marketing drives product development by determining what customers need at the very beginning of the process. What many people think of as marketing is really advertising, sales (telemarketing), or marketing communications. Marketing professionals, also sometimes known as Product Managers, survey customer needs, review the competition, and meet often with R&D to determine what products to develop. Life science companies often start with scientists who have a great idea from being in the lab, and as they grow bigger the process of determining needs and developing products requires a formal process, also known as marketing (see the first part of the second quote above). This process improves the research process—when I started my Ph.D. some labs were purifying restriction enzymes in house! Can you imagine how slowly researchers’ work would progress without the thousands of life science product advances that have been made over the past few decades? I recently attended the Association for Commercial Professionals—Life Sciences (ACP-LS) meeting and met a great group of genuine people working in sales and marketing and striving to make scientific research easier and more productive. At the ACP-LS meeting I also had the great pleasure of finally meeting Hamid Ghanadan, founder of the life science marketing consultancy The Linus Group and a thought leader who paved the way for people like me to start Comprendia. Hamid recently came out with a book titled “Persuading Scientists” about the nature of scientists to be dually skeptical and curious. It’s a fantastic read and has many important resources, I highly recommend it. Hamid and I talked about the fact that this skepticism is one of the reasons why scientists hate the idea of “marketing.” As you can see, neither Hamid nor I included the “M” word in the names of our companies, as we work with many who have scientific degrees—the industry’s ironic PR problem is no secret! 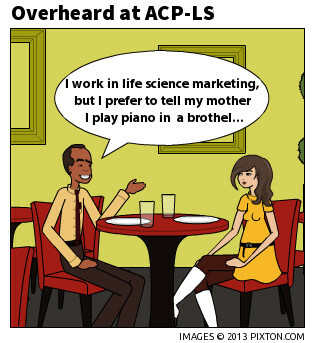 Let’s circle back to why life scientists’ distaste for marketing is harmful. We are in close contact with local researchers through bimonthly events we hold with the San Diego Biotechnology Network and conferences we speak at and attend. It is troubling to see that many researchers trudge through their Ph.D. and postdoc hoping for a faculty position, when only a small percentage will succeed. They then scramble to find something at the eleventh hour, rather than considering their prospects in non-academic fields, promoting their work, and cultivating a diverse network during their time in academia. We also see entrepreneurs with a great idea or even a product they’ve developed, but no skills as to how to commercialize it. Scientists’ reticence to promote themselves and their work, along with the shifting media landscape, could be negatively affecting the public’s understanding of science and leading to less support for funding. Scientists need to embrace marketing not just for their own careers, but to engage the public about the importance of scientific research. The current government shutdown is negatively affecting science in many ways, just imagine the impact if all 400,000 US life science researchers took to Twitter and Facebook to explain the damage being done. It appears that the Wellcome Trust understands the importance of incentivizing UK scientists to engage in outreach, as evidenced by this recent article in the Guardian. What can scientists do to embrace marketing? Luckily, in the 10’s, many marketing resources, templates, and webinars are freely available on the web, including on this blog. I was happy to find one author helping scientists to embrace the “M” word with a book titled “Marketing for Scientists: How To Shine in Tough Times.” Social media is also a very easy way to get started with marketing, and resources such as ScienceOnline are very valuable, and there are also satellites forming in regions and scientific disciplines (ScienceOnline Oceans is happening this weekend). Also, scientists should consider their research as a “product” for their stakeholders (the public, which funds much of research) and strive to meet their needs by making it applicable and accessible to them. As consumers of life science marketing, I encourage researchers to hold companies to a higher standard and expect them to provide more value in their products and communication. In fact, companies may welcome feedback when products or tactics don’t meet customer needs. In addition, feedback can be given on how companies can contribute better to scientists’ well being (e.g., helpful webinars outside of their product area) or to the industry as a whole. Indeed, companies such as Life Technologies have run anti-sequestration campaigns aimed at empowering researchers to help fight NIH funding cuts. By viewing life science companies, and marketers, as partners rather than adversaries, academia and industry can work together to improve the state of our industry. A really nice, thoughtful blog. In light of this weekend’s Scientific American issue, I think we should look harder at how we can support science bloggers financially. If you are going to ScienceOnline 2014, let me know and perhaps we can approach them about a panel or program. Love this post. I used to work for an academic clinical research organization, and even when it was clear that more commercial competitors were getting ahead of us, there was A LOT of resistance to allocating resources to form a (very small) marketing team. The mindset was that we wouldn’t stoop so low as to market because we’re all about the science. Such a disservice to those who can benefit from that science! People will naturally push for their interests, but the kernel of marketing is matching multiple interests (company, client, customer, etc.) so all parties involved get some portion of what they want/need. Marketing’s just a tool. It’s how you use it. Like you said, to blame the whole field for people’s weight problems is a stretch.